After the death of guitarist Mike Scaccia in 2012, Ministry’s founding father, Al Jourgensen promised that 2013’s From Beer To Eternity would be the band’s final release. That was all before a real estate mogul/reality television personality with questionable business practices and even more questionable ethics was backdoored into the highest position of power in the nation that welcomed the former Alejandro Ramirez Casas and his family from Cuba in the 60s. In Al’s world, sentimentality is trumped – hur, hur – by the opportunity to express one’s displeasure and put America before a looking glass. He did it back in the 90s on Psalm 69 and the anger is equally palpable on this provocatively titled 14th studio album. As is de rigeur, AmeriKKKant is littered with soundbites (mostly political and many from the hairpiece-in-chief himself) weaved amid thick guitars, earthquake low-end and ‘Uncle Al’’s distorted vocal bluster. What’s most noticeably different is the album’s slow burn. Early tracks belie the fiery protest mood as it takes three songs for Al and crew – now featuring ex-members of Prong, Fear Factory and American Head Charge, alongside scratch-happy turntablist DJ Swamp – to gain momentum and not sound like they’re jamming on interludes. We’re Tired Of It is driving, choleric thrash welded with energised sample manipulation, Antifa calls out the alt-right with half-paced Bay Area guitar gallops while Wargasm unashamedly summons Jaz Coleman’s melodic grandiosity. 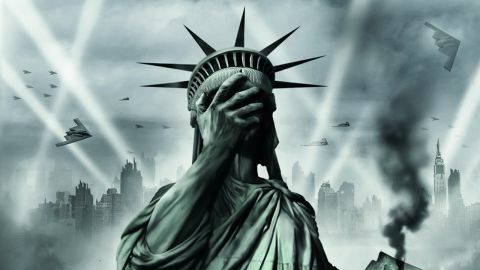 AmeriKKKant isn’t perfect, but it is an above-average example of the artistic reaction many hoped would follow in light of The Donald proving that the system is broken and that Americans have put their country at the mercy of Nielsen ratings.